Below is a leadership exercise from a nationally award-winning entrepreneurship class at the George Washington University in DC. This is an exclusive exercise designed developed to help bridge a leader’s vision of role model and mentors with their own vision, and is loosely based on a Harvard School of Education institutional problem-solving paradigm. Please click HERE for audio from exercise creator Kathy Korman Frey walking you through the exercise. Who is an “aspirational leader” to you? This could be someone you don’t know, but you admire. Write down their name. Who is a “real life leader” you know. This is someone you DO know, and admire, that you know or have met. It could be anyone ranging from a relative to a boss. Part a: Next, make two columns for question three. 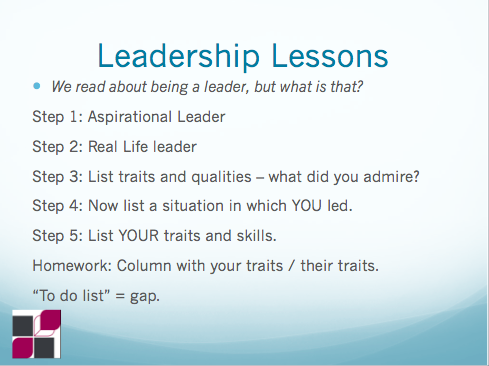 In the first column, write all the qualities and traits of the aspirational leader you admire. Do they think big? Are they compassionate? Are they….write down those traits and qualities. There may even be an example of the behavior, but this should be in addition to – not in place of – the descriptors of their traits. Part b: Repeat this for your “real life leader.” What admirable traits and qualities do they have? Repeat the directions for Part a and write the descriptors down in the second column of Step three. In this step you switch gears. Think of a situation in which YOU led. It could be at home, it could be a student club, it could be in a work environment. Describe that situation here. Last, just like in Step 3, make a list of YOUR leadership traits. Use this as a catch phrase, “This is how I would like to be thought of as a leader” or “This is the type of leader I would like to be.” All of these qualities do not need to be present currently. Some are there now, some you may aspire to. 1. Share your aspirational and real life leaders, and why. 2. Share the situation in which you led. 3. Share some points from your Leadership Script: The description of the type of leader you would like to be. Did you arrive at your Script from a combination of Step 3 and 4? Describe. 4. Entrepreneur or future entrepreneur? Consider tying this exercise into the “Entrepreneurial Traits” exercise of Module 1 in the EITC (Entrepreneur in the Classroom) curriculum. Click here for more. Entry filed under: Teaching tools, Uncategorized, Young Entrepreneur Foundation. Tags: Leadership, mentor, role model, Students, youth. How Much are You Worth? I Scream, You Scream, We All Scream for… Lemonade?